Last week when I went to the Farmers Market I bought Tomato Basil spread from a vendor and I just fell in love with. The only thing was it was either $7.00 or 3 for $5.00, plus I can only get it at the Farmers Market. So I decided I would make the spread myself and you know what? It turned out even better. Plus I saved myself some money considering this probably cots me less than a $1.50 to make. Here is my Tomato Basil Spread. This spread is so creamy delicious! 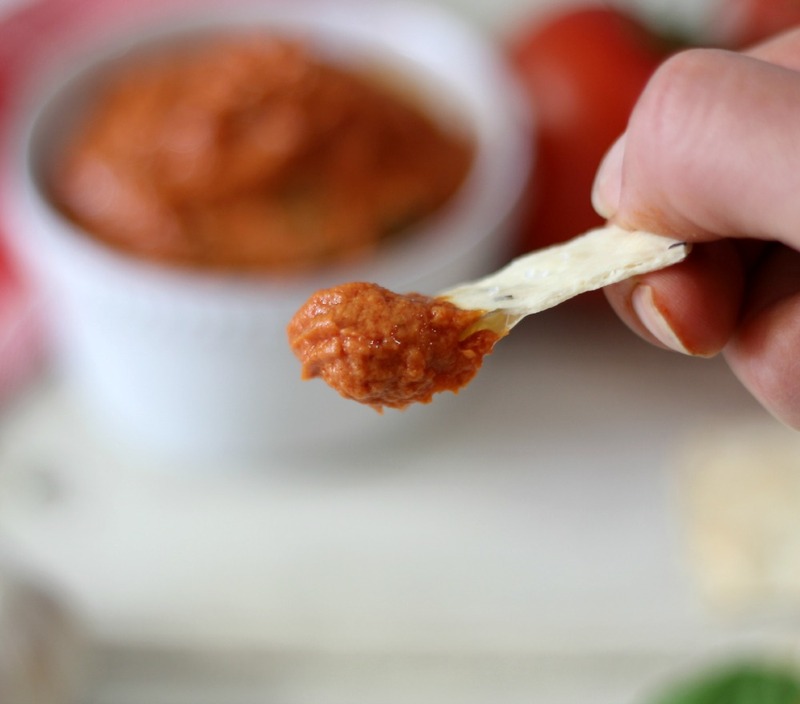 If you’re a fan of pasta sauce I think you will love this spread! It’s taste like robust tomatoes with fresh garlic and basil. Oh my gosh, just amazing!!! I am so happy that I created this and happy that I do not have to travel to the Farmers Market to get it! The spread would be amazing on wraps, panini sandwiches, dipping celery, baguette or breadsticks in. The possibilities are endless!! It makes for a great use of leftover tomato paste and a little bit goes a long way. 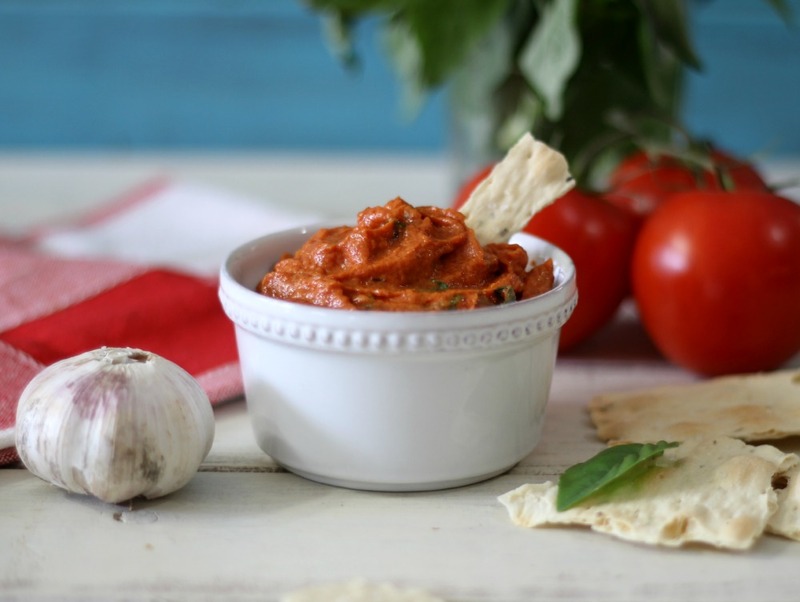 Make sure you get a good tomato paste when you make it for even better tomato flavor! 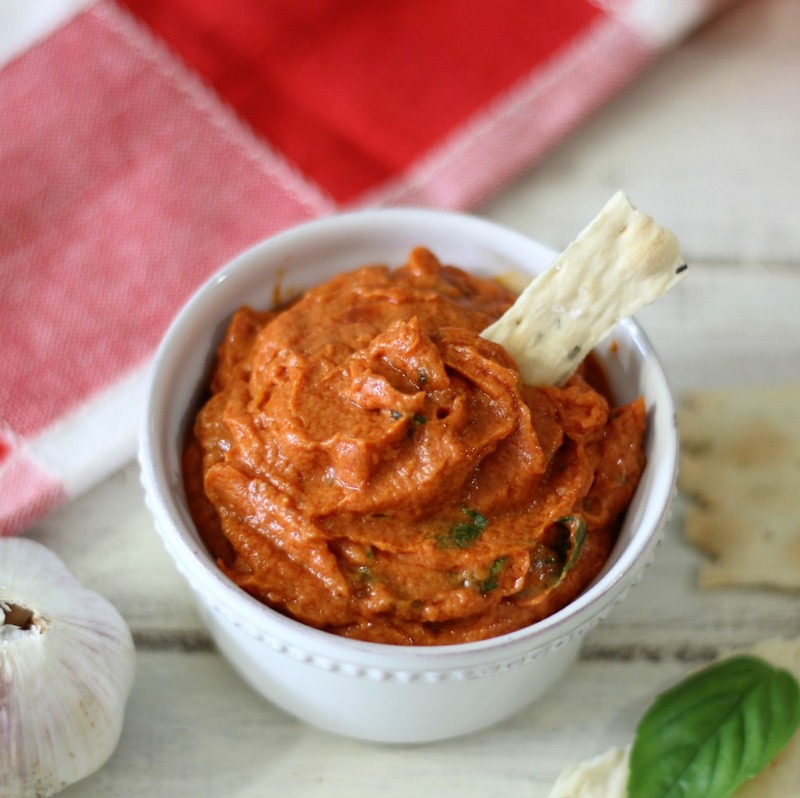 The Tomato Basil Spread is made with tomato paste, fresh garlic, fresh basil, olive oil, oregano and to make it creamy and to cut down on the acid, greek yogurt. I took the spread to work and it was a big hit. I used Trader Joe’s Italian Rosemary Crackers to dip in the spread. Have you tried those crackers from TJ’s? They are so good! I wish I took a picture of the box for you. 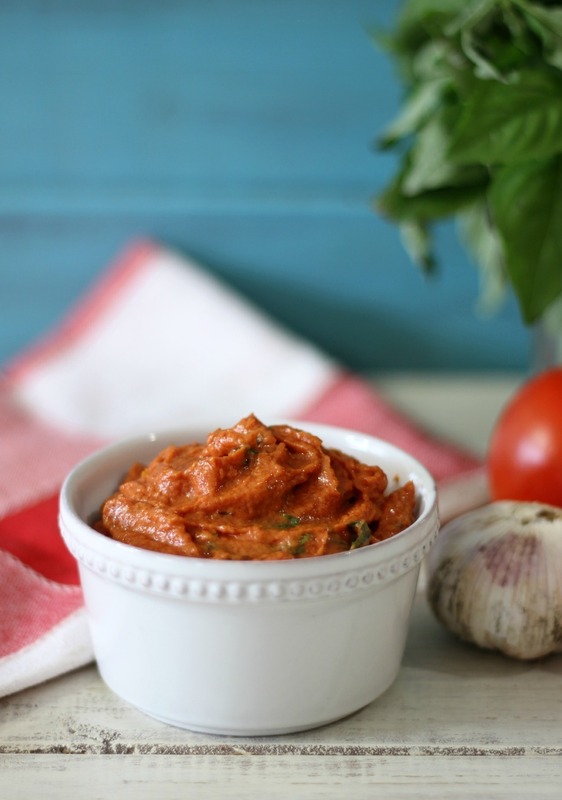 A creamy, rich, robust Italian tomato spread that is slightly garlicky with little hints of basil and made with greek yogurt. In a bowl, add garlic, tomato pasta, sugar, salt, pepper, thyme and oregano and mix until combined. Stir in fresh basil leaves. While stirring, drizzle two tablespoons of olive oil. Mix in greek yogurt. Serve with Italian crackers, celery, bread sticks, use as a sandwich spread or smear on a baguette. Thanks Peg for letting me know, I missed the most crucial ingredient in the recipe! 🙂 I fixed it now. 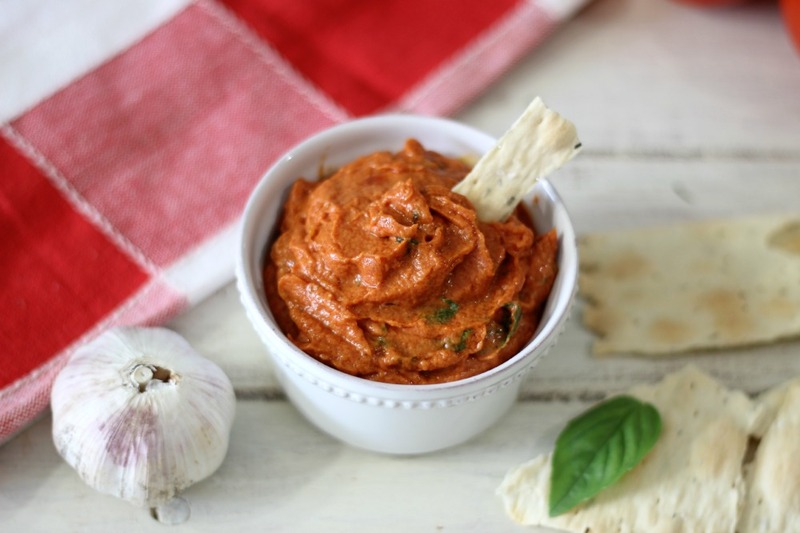 This tomato and basil spread looks absolutely fantastic! I want this now! I’m going to put this on my Caprese sandwich tomorrow in place of the pesto. I’m already excited for it! I also want to try it out on a loaded veggie sandwich. I don’t like ketchup so I think this will be a great substitution for me! I am so glad you like it! I have to say it is one of my favorite new spreads. I bet it would be amazing on a caprese sandwich, which happens to be one of my favorite sandwiches of all time. Your right it would be a good sub for ketchup! Thank you so much for letting me know it turned out for you! Enjoy it!! I think I’ll make some again too! The sandwich was delicious! For an afternoon snack I had a tablespoon of this smeared on a slice of bread, topped with a couple tablespoons of mozzarella cheese and some red pepper flakes. It was a yummy pizza-eque snack for around 120 calories! At this rate I’ll have to make a new batch soon! I am so glad you enjoyed the recipe Anna! Your sandwich sounds just amazing!! Yum!!! Great job, especially on the calories! I am so happy you made this! Because I too am addicted to the tomato basil spread I buy from the farmers market. So happy it’s here for me to make myself now! And it looks just like the one I purchase. You’re welcome! I bought some from the Farmers market too and I had to try making my own. I think you will love it! do u have to use yogurt..i dnt want the dairy? How long do you think this will last in a fridge? I would think about a week or two. I think I may have bought the same spread from Farmer’s Market as you did! And now I’m addicted. 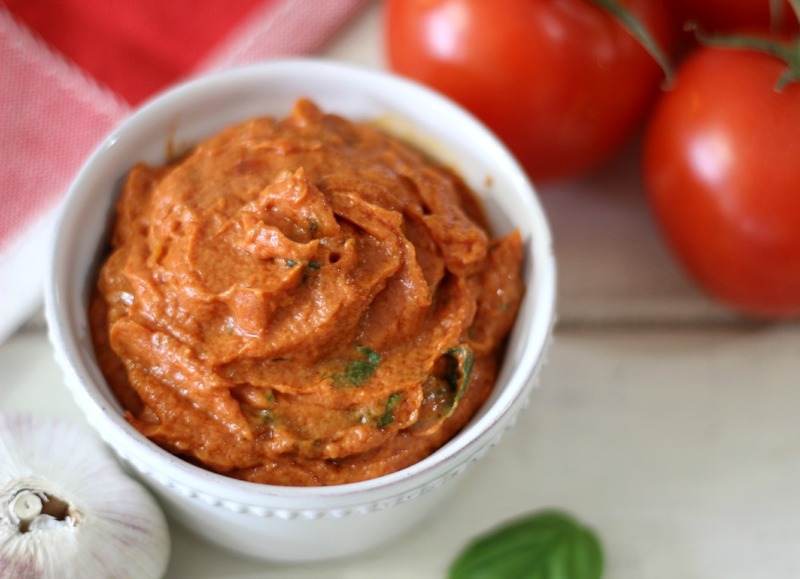 I just googled “tomato garlic basil spread” and your recipe came up. Can’t wait to try it!